Hudson Shuffleboards has done it again! 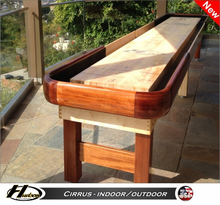 Introducing the first All-Weather grade shuffleboards specifically designed and built for outdoor use. With space being an issue inside, Hudson Shuffleboards has designed a line of shuffleboards made to be enjoyed outside. 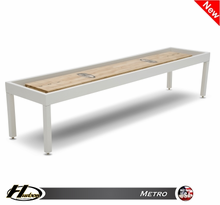 These shuffleboards are made-to-order using the finest craftsmanship found only on a Hudson Shuffleboard. The Cirrus table comes standard with all the features ready for outdoor use. Our new Metro line can be upgraded for outdoor use by selecting the "Outdoor All-Weather Upgrade" option. This option includes the addition of an all weather plank, outdoor grade carpet for the cradle, and an All-Weather Sunbrella table cover. Playing surface can be customized with your logo.